The world of work is being disrupted by technology on many levels. This trend offers us many new and exciting opportunities. As we grow older and are close to the end of our formal career, we yearn for more time to be able to do the things we love. In this article, I want to chat about how hobbies can also be used as a driver of change, healing and engagement. The range of hobbies is wide and varied. Some of us want to learn and others are keen to share and teach. Many are saddened when they need to downscale and do not have place for their hobby in the retirement development. How can we think differently about these challenges to open up a different future? Take for example, a new retirement estate development being built. Imagine including, as part of the design, a space for a gym, art room, sewing space, carpentry and technology. The space is equipped and funded by the owners of the development and maybe residents pay an extra levy to use this space. In this way, expensive equipment is shared, learning happens and classes can be organised. The person who is skilled at their craft gets the opportunity to share and maybe even earn from his hobby. “We live in a culture, time, and place where creative people have to use creative means to accomplish something that was always the most ordinary, customary thing in the human experience: older people and younger people sharing their lives,” says Bill Thomas, a doctor and international authority on geriatric medicine and eldercare. Imagine if we could open up these “hobby hubs” to younger people, keen to learn a skill from a master? The younger generation may be keen to learn a skill and not have the money to invest in the equipment. In this way, we have both joy and legacy as an elder teaches a younger person something he or she loves. This is both uplifting and great for our health and we are given the opportunity to pass on the baton and skills to our younger generation. Teaching a group how to record their histories through blogging. The world has changed. Creative crafts are now a place of healing and sharing. How do we ensure that we do not lose these very important parts of our lives and thereby limit changes to interact with others in our communities? Computers were the size of houses when we were growing up and technology is still a challenge for many of us. I made a decision about 12 years ago to be curious, seek help and become part of the online world. I am so grateful for the people, lessons and tips that I have gained as a result of not fearing this amazing new technology. The tools I share with you I use across life and business. If you are thinking of starting your own business in this season, why not start the process today? Smart phones and tablets have made life significantly easier and today most people have this power in their hands. The decision is to decide on what you need and then go and look for the applications. Seek help by attending a workshop or having a number of one-on-one coaching sessions with someone who can guide your process. Then JUST DO IT. I have had my own blog page for the past ten years. I use this as a space to journal, write and share my thoughts. Two years ago, I printed out a copy for my Mom and children as a Christmas gift. They all said to me it was one of their best gifts. One of the best applications for designing your own website. Easy to use, many different plug-ins to add depending on your needs. I have children and family on 4 continents I am grateful every day for Skype. It has allowed me to chat, engage, coach and be part of international group calls across the globe. Many think that this site is only for professional business people. It is key to be clear about both your interests and business needs to be actively involved on LinkedIn. I love what I learn from those that I am connected to. Once I have met someone face to face I always go and connect with them on LinkedIn to stay in touch. This tool is great for small group communication, picture sharing and much more. On a project we completed in 2015 we used it to capture photographs from 27 schools, the co-ordinates of where the schools were and as an instruction and encouragement tool for the 10 coaches working on the project. I also use the call side of this tool when I travel. The calls are clear and free in a Wi-Fi zone. I love Twitter. I have been able to engage and communicate with thought leaders globally who would not ever have been on my radar in a flat world. I have divided the people I follow into lists and this helps to read what is relevant. This is the first place I go when news breaks. I can learn much faster here about the real situation, rather than waiting for print or television coverage. This is the first place I go every day. A catch up on my online network, news and connections. I have three kinds of pages. My own personal page which is more my family, friends and connections. My business PAGE for Refirement Network where individuals can join for updates and articles on the work I do. I also have a number of Refirement GROUP pages. This is more for a small group of individuals with common needs to connect. Here others can add friends to the group, so it allows for fast growth when there is an active involved community. Messenger is part of Facebook and allows for private conversations with people in my network. This is a great tool to use when working globally. One is able to trade, receive payment in any currency and then transfer back to a local bank account via FNB. If you are coaching, selling or contemplating running a global business this is a must have tool. A wise decision for us South Africans with our current currency challenges. This is an easy tool to gauge answers from your network or community. This can be used in a business, community or with family and friends to get some quick answers. It is a new year. Time to plan and grow. Pick any one or two of these tools and commit to learning more about how they can add value to your life. We need to be constantly growing, otherwise we are slowly dying. In my presentations and in conversations with people older than 50, I talk about two ‘M” words we need in our daily lives: Money and Meaning. The first feeds our needs and wants, and the second feeds our souls and give us a sense of value in society. Meaning can add a richness to your life that cannot be bought with Money. Helping others who cannot repay what you offer is a form of leisure that we should all develop in some way as part of the design of our later lives. South Africa has so many needs and not enough people involved to get everything done. Volunteering gives you the opportunity to identify an important need and meet it – becoming part of the solution to our country’s challenges. Using your skills and abilities for something larger than yourself and your own gratification brings a deep sense of meaning and purpose to our lives. It involves living your life in alignment with your core values and not going against who you are in what you do. Many people express the deep sense of joy, inner energy and gratitude when they have discovered this sweet spot. For each person this will differ. It is aligned to our skills, experience and passion. For so many of us, this sweet spot finds or found expression in our jobs, where we feel or felt we add value and make a contribution. When we leave formal work, it is important to seek the same sweet spot in what we devote our time and energies to. This can be our new ‘work’ and, yes, it looks different, but is equally enriching and meaningful. “There are over 100 000 registered Causes in South Africa, but very few technology platforms that connect people who want to do good, to the organisations that need their help. We are the common denominator that will link the one to the other and in so doing, we’re facilitating real value for everyone involved,” says Hadfield. Here is a link to their site to see some of the professional services needed currently by different Causes. This platform is a great place to start your journey into discovering more about your “M” word. Enjoy the journey, discover a deeper meaning in your life and a joy that cannot be bought with money, but which ‘pays’ you in a new way, enriching your life. We all love to read about the stories of different people. Some are of the rich and famous, and some are just the stories of how ordinary people are making a difference or touching the lives of others. Each of us has a story that is unique. It is sad that too few people get to share or live out their story. The reason is that we settle for the small messages that life has sent us over the years. You are not good enough, smart enough, tall enough. We all have some examples that surface from time to time. The second reason is that instead of understanding who we are, we allow life to dictate our journey. This sentence is easier to write than to live, so I do understand that many of us have been challenged, made sacrifices, walked through valleys and experienced setbacks. It is often on these detours that we learn many lessons that shape who we become. These detours are not your life and we often need encouragement and a helping hand to step back up onto the road of life designed especially for us. 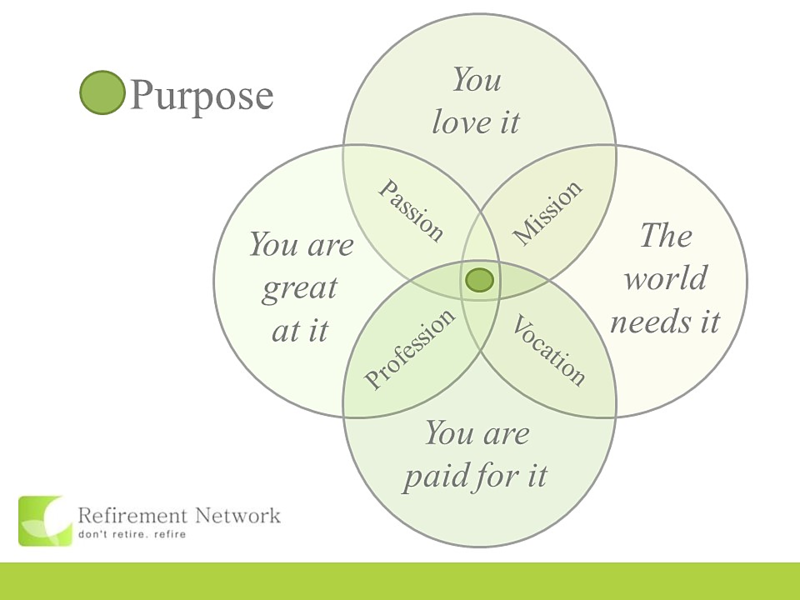 A full life is one that engages your skills, passion and talents, uniquely mapped out for you. That is your true story. To ensure that your life reflects this story, you need to do some work on discovering this individual: time to read, journal and have some long reflective conversations with one or two chosen individuals close to you. Authors spend many hours alone, writing and thinking through the plot, direction and depth of their story. Yours is no different. It takes time, energy and some deep soul searching. For many, this is too difficult and that is why so few get to live an enriched legacy. Take the time today to make a decision to build an enriched story for your family and community to treasure. Reflect on the following questions over a period of time. Keep a notebook or journal of your thoughts and ideas. This process unlocks your future and your story. Think through the different stages of your life and document the highlights. Where has your work and life experience come from? List these. Map out your relationships that matter. Where do you believe you can be useful in the future? What is getting in the way of moving ahead? This process will help you to unlock some deep-seated ideas and overlaps. It is in the overlaps that the richness of your story has a future. Your story and life are unique. Be the best you can be and leave a legacy. We each have one. I would love to read yours. Take the time. It is worth it. Where does my story start? Many within this network may have read one of my articles published last year about The Story of the Black Mittens. Click here to read it. This kind gesture touched me deeply last May when my mom died. My sister living in the United States loved the story and started a Facebook page with the same name to encourage people to knit mittens as a gift to someone needing warmth and love. At the same time, I was made aware of another Facebook page (click here) where individuals were being challenged to knit or crochet blankets and join a movement called 67 Blankets for Mandela. I shared this link with my sister. She connected with one of the local ambassadors and was soon asked to become the ambassador for the East Coast of the USA. 67 Blankets for Mandela was started when Zelda la Grange challenged Carolyn Steyn in December 2013 to make 67 blankets before July 2014 and donate them to people in need. Carolyn took up the challenge, started a Facebook page and invited friends and family to help her complete this challenge. The movement has gained momentum over the past 16 months and created a world record by laying out the biggest blanket in the world. I have observed this movement with great interest and tried to understand the amazing growth, love and drive that this challenge created in so many in South Africa and around the globe. The rules were to make a blanket by hand and donate it for someone who needs warmth: a completely selfless act that costs money, takes many hours and, in the end, the product is given away. The campaign was taken into retirement homes, schools, prisons and community. Many young children learnt to knit and crochet and were taught by their elders who had the skills and the time. Wool was donated by those that could not knit and given to those who had time. This connection enabled many more to become involved and to feel valued while sharing their skills and talent. The Facebook page enabled everyone to share their handiwork and encourage others around the country. Groups were formed and many met in public spaces to knit and crochet and grow the movement. No-one was paid and yet so many feel enriched and blessed to have been involved. 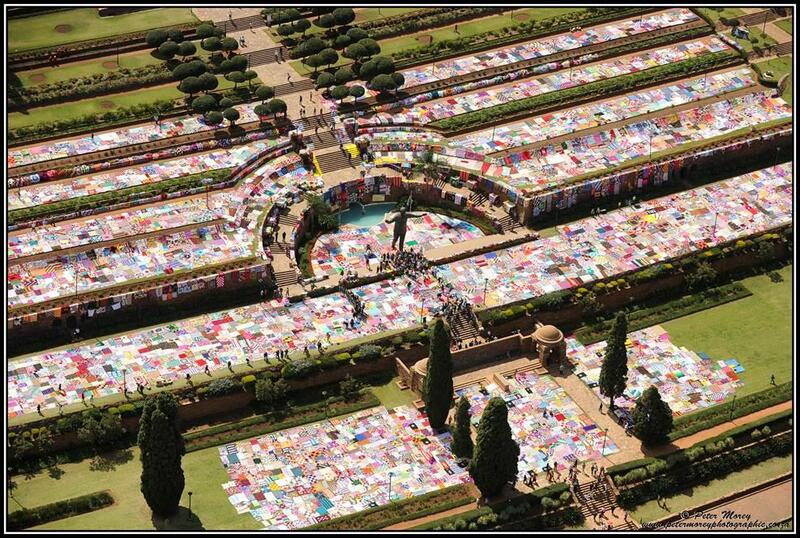 On 21 April, all the blankets were laid out at The Union Buildings to celebrate 21 years of democracy. 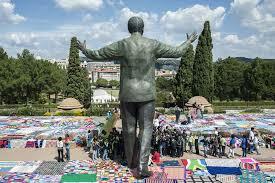 In the week when xenophobia was rife and many were feeling despondent about our beautiful land, another amazing picture was unfolding: the joining together of the blanket to break a world record and together show the world what is possible from ordinary people who care and want to make a difference. This movement will continue now with the next goal being Mandela Day on 18 July. It will soon be one year since my mom died. The selfless act of one woman who completed my last request to my mom is linked so closely to this story. My sister was in South Africa to enjoy this day at the Union Buildings and share in the great joy of the world record. Our grief is shared, but we are also healed by becoming involved and encouraging others. No matter who you are, grief is part of life. Giving back can be part of all our lives. It is amazing when we step out in our grief and give back how much richer our world becomes. Our career mind-set has taken an almighty leap from our parents’ generation to the current day. Then, they believed employment was for life: it was considered responsible and a privilege to have one career with one employer for 30 to 40 years. Today’s emerging work force, however, regards this approach as weird and boring. The world of work has shifted significantly and this brings a “new normal” for us to live and work by. The security of the 20th century workplace is no more. Loyalty between employer and employee is not what it used to be. We can never be sure if the company we work for may be involved in a takeover or collapse. While this is beyond our control, we can take the steering wheel and drive our own talents in the right direction. We need to ensure we are continually upgrading our expertise and much-needed skills for the 21st century workplace. Changes in the world economy away from 8-to-5 full-time employment are making it easier for people to continue working, but on their own terms. Also, growing global skills shortages mean that employers are willing to negotiate with older workers in order to still have access to their valuable skills beyond retirement. Many Baby Boomers have second or third marriages and large extended families with many dependents still to take care of, encouraging them to continue working as long as possible. A lack of sufficient retirement funding is also pressurising aging Boomers to work longer in order to save up sufficient revenues for what could be a 30-year retirement span. Statistics also show that people who remain active and mentally stimulated into their later years generally remain healthier for longer, further providing motivation for continued work in some form beyond 60. The new economy is called many things, including the relationship economy; the connection economy; dream society; the imagination economy and the exponential economy. The social intelligence of the connection age. What are some of the skills that will matter in the 21st Century? 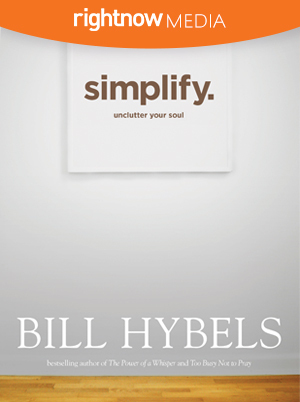 Having recently read Simplify by Bill Hybels (ISBN 978-1-41439712-2), I was prompted to transfer his message into some pointers for each of us to consider as we reach our next season of life. So what may this look like practically for any person over 50 who starts to think about the next 25 years of their life? It is around this age that many of us are sensing and experiencing major life changes in our lives. These do not all match exactly but will impact each of us in this season of life. If we are fortunate to have our parents still alive, we may be concerned about their health and finances. Having conversations that can take as much of the stress out of their situation without taking away their dignity is vital. You will also lose your parents in this next season and this will bring to an end a deep and most important relationship in your life. Take the time to grieve and celebrate your parents and build this legacy into your own family for the future. Your children will be reaching adulthood, leaving home and starting families of their own. What a privilege it is to watch our children as adults, becoming parents and building dreams and a future of their own. Where possible, allow your adult children to grow, learn and struggle the same way we did. It builds character and strength for what may lie ahead. I see too many baby boomer parents taking on too much for their adult children and this can cause enormous stress. Ensure that your finances, will and paper work are organised and easy for others to access and understand. I lost my Mom this past year and, as her Executor, have learnt so much about how I want to simplify my own life to ensure that my children will not be put through the stress I am currently dealing with. You may still have five years before formal retirement from your company or looking at succession planning for your own business. This is the time to start considering what your next season of life will look like from a WORK situation. The word WORK should be changed for this season to PLAY. I define PLAY as work that matches your skills, talent and passions in a mix of hours and responsibility that matches your unique profile. It takes time to find the right ingredients and is therefore not something you should only start considering once you have retired. Take short courses, learn and grow a hobby, network, read and engage with friends to navigate your way. You may even take on a coach to help you with this process. Your currency in this season of work may be money to sustain your investments or if you have been wise with your investments your currency could lean more towards meaning and purpose. The journey of life is filled with many lessons. There are many things we have done that we may regret. We may have had an unhappy childhood or a messy divorce. These feelings of regret, anger and resentment may be the very things that are causing your life not to be simplified. Toxic emotions manifest in poor relationships, bad health and can also lead to addictions. Finding help and working through these challenges will ensure that your next season is filled with joy and peace. The saying goes that all the money in the world cannot buy good health. In this season, take a look at your health from every aspect. What exercise can you do , how can you change your diet and lose the extra weight, what books or courses can you do to improve your mental stimulation and what hobby can you take on to balance some leisure in your life? Relationships are built up over time and need time and love to grow. Take a good look at the relationships in your life and consider if you have a good balance and leaning towards the ones that matter most. Your immediate family and close friends may see very little of the real you owing to stress and pressure from work and hobbies that do not leave enough over for those who really care about you. Human beings are all aware of these simply basic solutions. The challenge is to take the time to step back and analyse your life right now and make the decision to put some or all of them into practice. Our lives are not a dress rehearsal. It is never too late to leave a legacy. The time to start is now. SIMPLIFY. Volunteering creates value – inside and out! South Africa has so many needs and not enough people involved to get everything done. Volunteering gives you the opportunity to identify an important need and meet it – becoming part of the solution to our country’s problems. A volunteer is someone who directly assists others. They generally share themselves openly, are healthier, happier, live longer and lead more productive lives. Helping others, not for what you can get out of it, but for the sake of others, is a very fulfilling part of life. At the core of our willingness to volunteer lie our attitudes, values and beliefs about our role and function here on earth. If you realise that you are here for something bigger than yourself, you will be able to help others without wanting anything in return. Research causes or issues that are important to you to find out how you can get involved in helping out. Identify what skills you have to offer on a volunteer basis that will be of assistance to others. Combine your goals of learning and volunteering. Don’t over commit but rather do a manageable amount over a longer period. Consider local and global volunteer opportunities which could help you see the world while you contribute. Volunteering requires a shift from a world filled with material success to a world of significance. Have you ever volunteered your time and talents? What volunteer jobs did you personally benefit from the most? Volunteering bears many gifts, including fulfilment, involvement, purpose and meaning. Which of these gifts seems most relevant for your life right now? It has been said that giving is receiving, but can receiving ever be giving? How do you feel when you help someone? Below is a list of 6 common ways that people feel when they help another. On 15 May, I went past my Mom’s home to give her the post I had just collected as well as to say good-bye as I was going down to Cape Town for a few days. We chatted for a few minutes next to my car and I asked my mom a favour. The previous winter she had knitted me a pair of beige mittens that I found very useful early in the morning during our odd cold spells. Most of my wardrobe in winter is black, so I asked her please to knit me another pair in black for this year. The next day I received a call from my brother Frank to let me know that my Mom had died. She had a heart attack and was found early Friday morning in her flat. This came as such a shock to all of us as she was healthy and had lived an independent life for 82 years. At the funeral a week later, one of my mom’s friends let me know that she had a gift for me: two pairs of BLACK MITTENS. I asked her how she knew of this last request from me to my mom. She said my mom had come inside after I left that Wednesday and asked one of the ladies for some black wool, as I wanted mittens in black. My mom never finished the knitting, so one of the ladies decided to complete them as a gift for me. I know that this was a way that she too could mourn the loss of my mom and at the same time bless me. I cannot tell you how much this small act of kindness has touched me. I am reminded each morning of both my mom and this act of kindness. I do not knit or do any craft work in this life stage as I am very busy and feel that I would never complete anything. However, knitting a pair of mittens is a very small project and can be finished with a few hours of relaxing time in front of the television. I was sharing my story with my friend, Melodie, who told me to give her the mittens and she would write out the pattern for me. The next morning, I received the pattern and a purple set knitted by Melodie. Another act of kindness. I am now going to dedicate this project of knitting mittens to my Mom and the acts of kindness shown to me. We can all do small acts of kindness that hold no monetary value but touch the heart and soul at a deep level. Thank you again for this act of kindness in my life as I learn to live without my MOM. In 2009, a group of concerned citizens assembled to talk about the future of South Africa. Their discussion produced three possible scenarios for the future of South Africa. These are called the Dinokeng Scenarios. Read about these scenarios at: http://www.dinokengscenarios.co.za. There is only one scenario that most South Africans want to see and that is the one called WALK TOGETHER. This is a scenario of active citizen engagement with a government that is effective and that listens. So what does it mean to be an active citizen? It means that you need to be responsible, honest and look around your own centre of influence and try and make a difference. This may be in your community, your work or in some part of society where you can engage and be involved in positive change. ACTIVE is a doing word, and so requires action and engagement. It is so easy to sit on the side-line and criticise but it is only when you are involved that you will truly understand how this can change both your perceptions as well of those you are engaging with. My role in WALK TOGETHER is in the world of parenting and early childhood. We have 5.5 million children in our country under the age of five. The first five years of life define and mould the future of a child and the health of our Nation will need citizens who use as much of their potential as possible and at the same time are able to complete formal education with confidence so that they too will become productive citizens 20 years from now. I am involved in BrainBoosters to help influence as many parents, caregivers, CEOs and overnment leaders to take this challenge seriously. Each of us has children in our area of influence. It starts with your own children, those connected to you via employees and then further into the community in which you live. There is no citizen who cannot bring about change in this arena, even if it is only one child. The second part of the WALK TOGETHER scenario is a government that is effective and listens. I am encouraged that the government is in consultation on an ECD policy and programme for every child in our beautiful country. There are many people who are engaging in this conversation and hopefully the future will look brighter for all our children. Your responsibility is to make sure you get out and vote on the 7th May. Your voice and cross are needed to ensure that we hold our leaders accountable. Dinokeng is called a place of rivers… all our pasts have flowed together to meet at this place and time, and all our futures will flow from here.